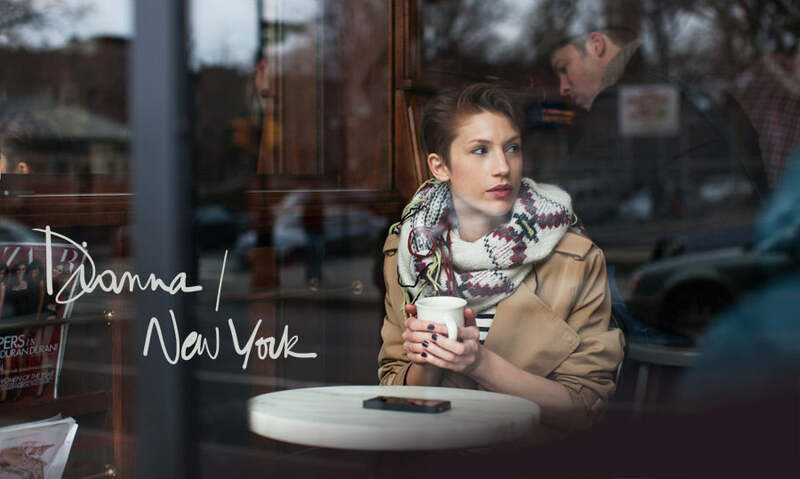 From Manhattan to Brooklyn, here are Dianas’s favorite places. Check out this picture of her at one of her favorite cafés, Smith Canteen..
How would you describe New York to someone who has never been? It’s a big city that can feel quite small. What’s your favorite hidden shop? I’m not sure anything stays hidden here for too long!!! I personally love Maryam Nassir Zadeh and Assembly in the Lower East Side. They always have a perfectly curated selection of pieces you won’t find elsewhere. And your favorite place to buy vintage? My favorite vintage spot is in the city: Narnia on Clinton street in the Lower East Side. What would you say is one New York clothing staple? Where’s the best place to buy treasures for a loved one? It depends really. I’m usually quite specific when buying gifts. D.O.C. wine shop in Williamsburg has an amazing selection of wines and grappa. I also love Mast Brother’s Chocolate for goodies and a tour! The best salon in the city? I love IonStudio in SoHo, that’s where I first cut my hair short. I’ve tried other salons but nobody does it quite as well. Your doing a staycation in New York, which hotel will you stay at and which spa will you go to? The Bowery Hotel and Bliss Spa. The best place to have a coffee and people watch? The Smile on Bond Street or the Brooklyn Flea. I love the lemon poppyseed cupcakes at Babycakes. What’s your favorite date spot? For a romantic candlelit dinner I like Peasant on Elizabeth Street. Where can you spot the fashion crowd? What is the one food you have to try in New York and where is the best place to have it? Pizza! Definitely! I love Roberta’s in Bushwick and Rubirosa on Mulberry Street. Where’s the best place to escape? Ideally upstate, but if I can’t get out of the city I love McNally Jackson bookshop (My favorite too!!!) in SoHo, I could sit there for hours. The water lounge at Great Jones Spa is also great for a bit of R & R.
Where’s your favorite place to get in a good work out? My favorite form of exercise is running. I like to weave through all the smaller blocks near my apartment in Carroll Gardens. The neighborhood is so quaint. I also love Verandah Place, which is narrow cobblestone street adjacent to Cobble Hill Park, it feels very European. What is one touristy place you still love visiting? I love Central Park. On a nice day you can sit with a bottle of wine and snacks or take a boat ride. Then afterward a visit to the Guggenheim or the Whitney. You’re meeting up with girlfriends for a night out, where are you headed? We’ll usually meet up for a casual dinner somewhere and take it from there. My friends are great cooks and great hosts, but if we’re going out to eat then Diner in Williamsburg is a favorite. Hotel Delmano nearby is a great spot for cocktails, I suggest the Devil’s Garden for a refreshing tequila concoction with bait of cayenne pepper. Can you tell us what your idea of a perfect day in New York is? A perfect day would definitely include sleeping in, followed by a late brunch. Vinegar Hill House is a great spot and a scenic walk from my neighborhood through Dumbo and along the Brooklyn Bridge Park waterfront. My friends and I also love to play a game of bocce ball at Floyd’s bar on Atlantic Avenue in Brooklyn Heights. What’s the best way to get around the city—car, subway, bike? Merci Garance pour cette jolie et cet interview/bons plans très sympa! Merci Garance pour cette jolie photo et cet interview/bons plans très sympa! c’est geant ces city guide ! exactement ce que j’adore ! J’adore!!! Ca me donne envie de (re)découvrir New York ..
Super, des conseils qui sortent des sentiers battus. Si j’habitais encore à NY j’irais faire un tour dans ces endroits. Beau portrait, belle interview! Central park is certainly a favourite! The new is a city I have yet to visit, I like her answers, the way she described it. What a useful and sweet intreview! Thanks for all the tips. Interesting how it also adds to a nice portrait of her. Fabulous photograph! I love the combination of scarf, trench coat and striped top. And, love, love, love New York! j’avais déjà envie de retourner à NYC, mais là, je crois que je vais prendre mes billets dès ce soir! As far as pizza goes, what about Viva Herbal? Totally down with Babycakes of course, and Blue Bottle for coffee, maybe Ninth Street Espresso. I also live in Carroll Gardens and relish all of my runs here – though I will say it’s a bit tucked away and I’ve run just about every street there is. No better way to know your city. Cute post! I have some amazing place here in Florence and I ‘ve always special times when I go there! Every city has its secret places! Il est temps que je me refasse une petite virée à New York ! Cette description me donne une folle envie d’aller booker un vol. j’en rêvais de ce post, je pars 5 jours à NY pour mes 21 ans (le 24.02) et j’attendais que ce poste tombe du ciel ! Ah je retrouve un certain nombre de mes adresses préférées et je note les autres qui devraient me plaire tout autant!!! Merci! This is a beautiful image, love that you took the shot through the glass. Her trench is really interesting with the extra large lapel. Amazing! I LOVE this interview. Such great questions and now I want to jet off to NYC like asap! Le Bain: the best place ever not only for the crowd but also for Ian, the cuttest doorman ever!!!!!!!!!!!!!!!!!! If you are hungry you can also enjoy a nice dinner at Indochine (near Astor Place) or at The Smile. Merci Garance pour cette interview et merci à Dianna pour nous avoir confié tous ses bons plans ! I love these interviews! Thank you for publishing them, such a beautiful accompaniment to your wonderful photos! What to look for: vintage costume jewelry!!!!! des boutons, des boutons, même des “cha…” pour tout customz …. j’ai aussi des adresses de lingeries de dentelles, faite main, de rubans, de plumes enfin plein plein plein ….. des adresses de “”futilités” les voulez vous ????? de vaisselle bon marché et design, de fleurs, de fleuriste, de blouson en cuir sur mesure, de dentelière italienne , sur mesure aussi !!! et encore et encore …..
Elle est tellement canon que ca donne envie de tout couper !!! My, oh my, I must agree with her on the Babycakes’ cupcakes! I don’t know if I could quite claim it as my favorite bakery in New York City, but they do make a phenomenal lemon poppyseed cupcake. Very good ,helpful interview! She is very beautiful too. such a great interview, she’s adorable and inspiring! Dianna est très très belle, la coupe courte lui va à ravir. Et son écharpe me fait les yeux doux… Une idée d’où elle l’a fait sienne? Cette photo d’elle est sublime ! Tout un monde d’adresses à découvrir ! That photographs is o pretty! Je me disais aussi qu’il y avait de plus en plus d’attente au Delmano… C’est parce que c’est devenu branché. love these tips! I hope I come there soon! she definitely must keep going to the same hairstylist… she looks gorgeous! She is soooo beautiful! And lives in NYC… I’m jealous. Et je suis sûre qu’il y a plein de lyonnaises parmi tes lectrices, qui adoreraient découvrir de nouvelles adresses! I love the mixing of patterns and textures she’s doing here! So great! The photo is amazing, as was the interview. Love the scarf with the classic trench! @ Zadig : Je suis lyonnaise et pour commencer à connaître les endroits de Lyon, procures-toi le livre intitulé “Le Petit Paumé” (peut-être que tu l’as déjà) . Il répertorie tous les lieux à Lyon suivis de commentaires très sympa. Ce guide lyonnais est un événement annuel car il est fait par les étudiants de l’EMLyon, gratuit et se distribue dans la rue en septembre. Cependant, tu peux peut-être le trouver à l’Office de Tourisme. Certes, tu n’y trouveras pas forcément des endroits hyper secrets ou insolites mais c’est un très bon guide pour commencer à découvrir Lyon! Ooh makes me want to go live in New York! But then again there are so many other great cities with a particular appeal and essence where I’d love to live, Berlin, London, Amsterdam, Seoul, Tokyo, Singapore… life’s too short! Absolutely love the picture and Dianna. and also love the interview – I scratched my head to remember precisely about New York (as I love everything) and it came back to…my hair again – it always looked stunning there (it never does normally either too frizzy or too straight or too something I don’t like). But in NYC vavaboom! Maybe it is the water, maybe it is the cupcakes…. Je suis fan de Mc Nally & Jackson! Le public des conférences littéraire y est délicatement vêtu mais surtout, le rayon photo/design/architecture est extra! Yay! I love Dianna! (not sure what it is.. the short hair? the fun expression? [in the first short hair photo] the casual coolness? Perhaps, all of the above!) And it’s fun to know where to go in the big little city of NYC! c’est sympa cette idée de nous donner des idées justement !!! elle est très jolie en tout cas !! j’aurais aimé avoir ces jolies adresses quand j’étais à new York, snif ! Beutiful scarf and her hair is great. I have long hair in a similar color tone, however, short haircuts like this I like very much. this has just wet my appetite for new york very thoroughly.. thanks!! new york new york. its refreshing hw she describes it -so unlike the usual..where stars are born..dreams come true. how i would love to visit ny! Love her scarf in the photo! Very keen on going to New York! Thanks for the things here Garance. Loving Dianna’s lip color ! Is it MAC? Oh but isn’t LE BAIN just awful? what an awesome marant scarf. i want it so bad. she looks incredibly chic! Love this city guide! I have been to New York several times, having lived in Westchester for 3 years – but throughout that time I was only in Brooklyn once. Nice to have some spots I can check out on my next visit! I was young in New York in the late 80’s……………….. Et si tu venais découvrir la douce folie de Copenhague avec moi pendant la Copenhagen Fashion Week ? Je vais noter ces adresses ;) Très belle photo, j’adore son snood ! nice photo! …pourquoi elle n’a pas voulu couper ses cheveux avant :) ? Great advice! Those are all of my favourite places too in NY! A quand l’interview d’une de tes copines sur Berlin Garaaaaannnnnce :D !!!!!! Ce qui est impressionnant sur ce blog, ce n’est pas que cette photo soit magnifique, c’est qu’on l’impression que c’est “facile” pour toi de sortir quelque chose de ce niveau, il y en a tellement! Merci à Diana pour ces bons conseils et merci à vous de nous les faire partager. New-York City ne manquent pas de petits et de grands magasins pour le shopping, de cafés et de lieux toujours plus surprenants les uns que les autres à Manhattan, Brooklyn, dans le Bronx et le Queens. Love her style! thanks for the tips! Remember, you are looking for the natural, sulfate free shampoo for your hair type. Coiled hair has certain hardships when protecting moisture content which then triggers brittle hair. the hair shaft), and is rated as low, normal, and high.